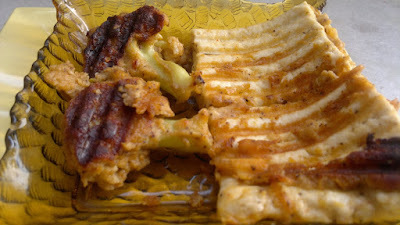 Tried this innovative way to make the cauliflower cheese tikka in sandwich griller and outcome was very nice. 1. Marinate – To prepare marinate, mix curd, besan, ginger garlic paste, spices, red chilly powder. Mix it well and put the cauliflower and paneer pcs into it. Keep it in refrigerator for 1 hour or atleast for 15 min. 2. Heat the sandwich griller and put all the pcs in griller. 3. Serve hot with sauce.